When you think of the most common lower body injuries, you think ankle sprains, shin splints, runner’s knee, jumper’s knee, fasciitis, or Achilles tendinitis. When you have these injuries, you treat the injured area. We might be overlooking a little, but big deal. Dysfunction in the big toe influences every step you take, every lunge, every jump, and every stride of every run. Ultimately, it can be a direct result in many of the aforementioned common lower body injuries. If you have dysfunction (pain, instability, or hypomobility) at the first big toe joint (MTP joint), it could wreak havoc on the entire kinetic chain. Normal range of motion of the big toe is 40° flexion, 80-90° extension, and 10-20° abduction and adduction. Lack of motion, especially extension, will create compensatory movement at other joints. Common big toe issues such as, hallux valgus (bunion), hallux rigidus, turf toe, sesamoiditis, and gout will limit toe mobility. Below is an image of a client who demonstrates normal range or motion on the right and limited toe extension on the left. This entry was posted in Injury prevention, Low-Back, Rehabilitation, Running, Sports Medicine and tagged Achilles tendinopathy, arthritis, dysfunction, hallux, jumper's knee, knee pain, mechanics, Range of Motion, runners knee, running mechanics on November 12, 2014 by Joshua Stone. Each day we are bombarded with new data. My goal is to share a breakdown of what I have discovered and read this past month. There is a little something for everyone here. How do I choose which articles to share? Is it clinically relevant? Does the story share something new or raise an interesting question? Most studies have some internal flaw that can be poked and while I try to only share those having high quality, my number one goals is to share something unique, progressive or surprising. In the recent release of The American Journal of Clinical Nutrition there is a good article supporting the benefits of a high-protein breakfast. Data reveals that a high-protein diet alters ghrelin and peptide YY concentrations subsequently leading to decreased appetite and also curbed late night snacking. Is this study perfect – no. But it is pretty darn good – Yes. I have been blogging on this topic for sometime. Where, when and why did the public begin thinking high protein intake is unhealthy? Did you know quality of protein is measured by how it compares to egg protein? That is because the protein in egg, albumin, has near perfect amino acid distribution. Yet many consider eggs bad. Here is another topic area I have been yapping about for some time – risk factors for hamstring strains. This systematic literature review was first published online and is now in print in the latest edition of the British Journal of Sports Medicine. This SLR included 34 articles for review, which is a pretty good number to include. Unfortunately, only 1 evaluated hip extension strength. Three found decreased hip extension ROM measures indicating shortened hip flexors. It baffles me as to why studies do not look at glute weakness and hip flexor tightness as a risk factor for hamstring strains. I’ve written about this and hope someday a good study will come out and study the correlation. Mild Traumatic Brain Injury – MTBI is getting a lot of media attention lately and rightfully so. NFL labor union disputes and an enormous amount of published research has athletes and parents taking MTBI seriously. If that wasn’t enough, Junior Seau’s suicide was linked to depression secondary to chronic TBI. In the Archives of Physical Medicine and Rehabilitation, April 2013 issue, an article discusses depression after TBI. It’s a nice short quick-hitting synopsis, with full-text available. I subscribe to daily email updates from ScienceDialy. Two or three times per week they share something good that I get caught reading. Two articles they shared link positive benefits of Vitamin D. One shows that Vitamin D replacement improves muscle efficiency and another found Vitamin D may lower diabetes risk in children. Now I am not advocating to go overboard on Vitamin D, but I am saying drink Vitamin D fortified milk and cereals and get outside in the sun to ensure you are getting adequate vitamin D.
ScienceDaily also had an write-up that I loved regarding foods to help fight inflammation. The article states citrus fruits, dark leafy green vegetables, tomatoes, and foods high in omega-3s, such as salmon are anti-inflammatory foods. Notice none of these foods are grains, breads and/or pasta. All are earth foods and not processed. This supports and is similar to blogs I wrote previously: how the US Food Guide Pyramid and MyPlate could be to blame for our chronic disease epidemic, another which is very similar linking arthritis and osteoarthritis to diet. Finally two of my most popular posts written Stop Destroying Your Body and Is Your Diet Making You Sick discuss the link between diet and disease. There are so many smart people out there and I enjoy learning from them all. Here are some good blog posts from this month. The first is from Sport Injury Matt (@SportInjuryMatt – twitter handle). He had two posts about foot mechanics and foot wear. Part I shares good crucial information on foot mechanics. Part II of this post talks about what one should run in and considerations when selecting certain shoes. My good friend Jay Barss (@sportsrehabtalk – twitter handle) is new to the blog and twitter world. He is a smart dude and deserves some following. His most recent post talks about the a new perspective on management on patellofemoral pain management. As we all know, correction of faulty movement patterns is critical in management of the oft-diagnosed PFPS. Last is a series posted by Allan Besselink (@abesselink – twitter handle). If you have not followed Allan’s blog I highly recommend it. In fact his blog was recently nominated as top choice for health and wellness. Everything he posts is high quality. I particularly liked his three-part series titled the Low Back Pain Paradox. Low back pain effects 80% of the adult population and Allan does a great job covering all the bases in Part I, Part II, and Part III. This entry was posted in Chronic Disease, Fitness Training, General Illness, Research Review and tagged arthritis, Chronic disease, chronic inflammation, Concussion, depression, foot mechanics, hamstring, knee pain, low back pain, nutrition, Protein, running mechanics, shoe selection, TBI, traumatic Brain Injury, vitamin d on March 28, 2013 by Joshua Stone. According to the CDC approximately 1 in 5 adults and 50% of older adults (> 65 yrs of age) have been diagnosed with some form of arthritis (1). The physical pain associated with arthritis is well documented, however, there is a large social impact on arthritis suffers. From an outsiders perspective, arthritis goes undetected. Outsiders do not see the pain or suffering that arthritic patients must suffer through. They are often labeled as weak, malingerer’s, or even lazy. Point is, many people with arthritis are having difficulty performing simple activities of daily living. The purpose of this blog is to provide a high-level overview of the disease and share basic exercise and dietary guidelines that can provide a holistic approach to reducing symptoms, improve quality of life, and functional outcomes. There are more than 100 rheumatic diseases and conditions that affect joints, the tissues which surround the joint and other connective tissue (1). It is the most common chronic musculoskeletal condition in older adults. 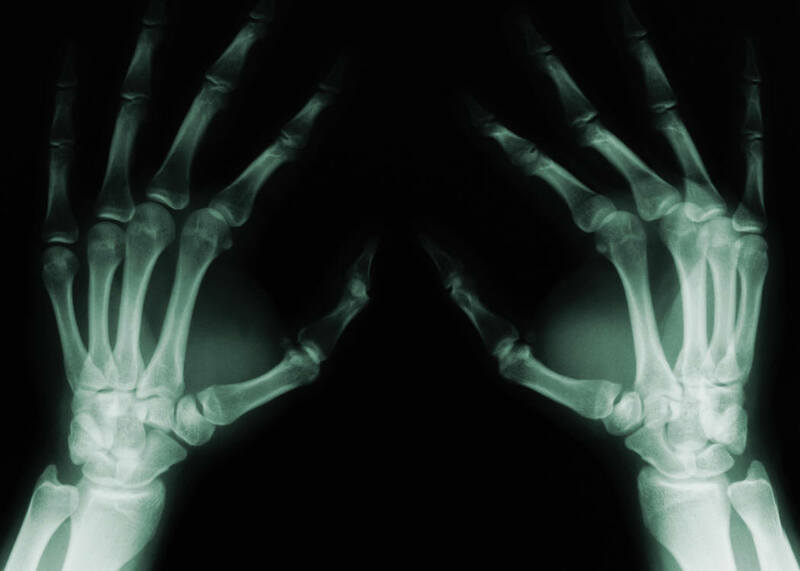 The two most common forms of arthritis include osteoarthritis (caused by damage or wear and tear) and rheumatoid arthritis (autoimmune causes). Osteoarthritis (OA) is characterized by the gradual deterioration of cartilage within a joint (2). It is commonly developed in load-bearing or highly mobile joints, such as the knee, hips, fingers, lower back, and feet. Often, those who suffered a significant injury to a joint are at an increased risk of developing OA. For example, knee OA is very common following ACL tears and surgery. The internal joint damage caused by the injury compounded by incomplete rehabilitation (prolonged inflammation and muscle weakness) are the perfect ingredients for OA development. The synovium of a joint produces the lubricating substance, synovial fluid. Healthy cartilage functions much like a sponge, it is receives nourishment by absorbing synovial fluid during joint movement. As we age, the synovium decreases its production of synovial fluid, we move less, and inflammation the articular cartilage increases resulting in dehydrated / malnourished cartilage). This creates a vicous inflammatory cycle. Inflammation causes pain, loss of function, which eventually leads to muscle wasting and cartilage deterioration. Overtime, the poor cartilage condition can result in the formation of exotosis (bone spurs) that further damage the joint structures, increases pain, and creates a loss of function. The most common symptoms of OA are pain, inflammation, reduced range of motion, and grinding sensations upon movement. As cartilage continues to detoriorate, pieces of cartilage my break free and float withing the joint (osteochondritis dissecans). The floating bodies will sometimes lock or catch the joint during movement. This locking or catching is very uncomfortable and sometimes painful. There is no cure for osteoarthritis. Since pain is alleviated with rest, many of those afflicted tend to avoid regular exercise for fear of pain or flare-ups. Despite this, a recent study demonstrated that older adults who regularly participate in aerobic and resistance exercise are effectively able to relieve arthritic pain and improve joint function (4, 5). This creates a paradox for optimal treatment (movement vs. rest). Rheumatoid arthritis affects approximately 1% of Americans. It is an autoimmune disease where by the body’s own immune system attacks joint structures, including cartilage, synovial membrane, and ligaments. Rheumatoid arthritis is a systemic condition characterized by periods of activity and remission where affected joints are painful and swollen in addition to whole body symptoms of fever and malaise. Currently, there is no cure of rheumatoid arthritis, but there are medications designed to relieve symptoms. Although I have great respect for western medicine and the research that pharmaceutical companies do to help cure chronic diseases, I have always been a believer in the holistic approach. The body is a self-healer – its own internal mechanic. As I mentioned previously, cartilage gets nourishment through dynamic pressure gradients caused by movement and joint loading. Most people with arthritis can safely participate in physical activity programs to help the disease. Many studies have shown physical activity to have a positive effect on the reduction of arthritic pain. A 2010 agenda released by CDC lists physical activity as a priority intervention to improve arthritis symptoms and prevent arthritis-related limitations in activity (6). 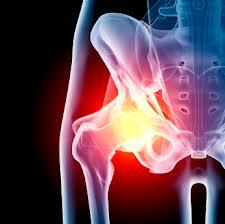 Unfortunately, there is a fine line; arthritis causes pain and subsequently, sufferers will not move due to pain. The perpetuates the disease and worsens symptoms. So movement is prudent, however we must be careful and be cognizant of exacerbating the issue. Below are some exercise guidelines. Rheumatoid arthritis results in early morning stiffness, so avoid early morning exercise. Avoid end ranges of motion exercise as extreme cases may allow you to move in a small mid-range of motion only. Be certain to distinguish between exertional pain in the muscles and pain in the joints. If any movement causes moderate pain in a joint, stop immediately and modify or regress the exercise. Always move joints through a slow and controlled range of motion. Avoid fast or jerky movements. Progress and increase exercise intensity very slowly. Exercise sessions should be relatively short and of low to moderate intensity. Self myofascial release (foam rolling) might be painful, but try it. Use a circuit or peripheral heart action training system. Avoid high reps or high loads. Use thera-bands or cuffs when possible to avoid gripping if hand and grip strength is a problem. In severe cases training sessions maybe have to be limited to short bouts (8-10 minutes at a time). Emphasize the development of functional flexibility and eccentric control through simple reactive training exercises. forward lunge with emphasis on lowering. Eccentric training will improve soft tissue to absorb ground reaction forces and reduce the force transmission to damaged joint structures. Water aerobics or swimming may be the best environment for clients with severe arthritis. 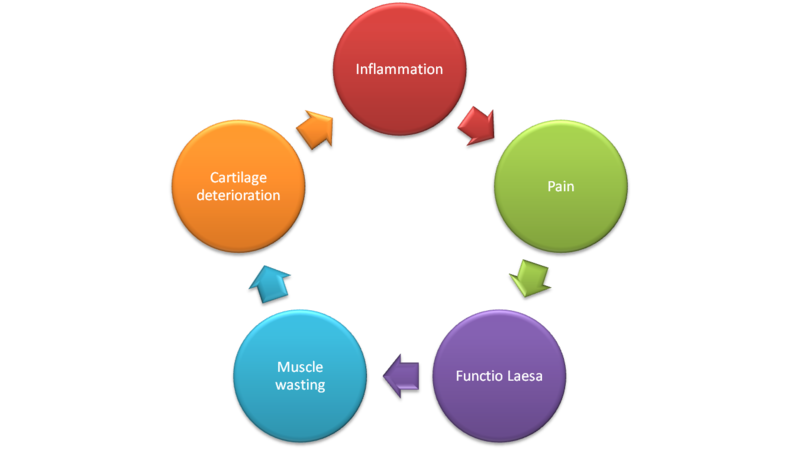 Arthritis is a chronic inflammation cycle, where inflammatory mediators remained elevated and a continued process of degradation ensues. Individuals with chronically elevated inflammatory markers are at high risk of chronic disease and now research shows that poor diet can also contribute to increased inflammatory markers. I wrote about this in a previous blog entry titled “Is Your Diet Making You Sick?”. Excessive consumption of refined carbohydrates and low dietary fiber intake is strongly associated with the production of proinflammatory molecules (7). One large study compared a western diet, which contained more red meat, refined carbohydrates and saturated fat to a paleolithic diet (8). The Western diet group had greater levels of inflammatory markers, including C- reactive protein (CRP) and E-selectin when compated to those following a paleo-like diet (8). Clinical studies in found frequent nut and seed consumption is associated with lower levels of CRP, Insulin-like growth factor (IL-6) and fibrinogen(9). Consuming an almond-enriched diet for four weeks significantly decreased serum E-selectin compared with the control diet in healthy men and women (9). The rise of these inflammatory diseases over the past few decades may be linked to the Western diet of saturated fats, low antioxidants, and refined carbohydrates. A diet rich in omega-3 fatty acids such as fish and nuts as well as whole grains and high fiber have been shown to reduce chronic inflammation markers in the blood. Arthritis is a serious chronic inflammatory disease which has both physiological and psychological effects on overall health. Pharmaceutical companies continue to search for a magical cure for arthritic conditions, but to date nothing has been found. Thankfully, we can do something to help relieve the pain and symptoms of arthritis. Creating a safe and systematic physical activity program can help prevent cartilage deterioration and improve overall function. In addition, a dietary change can also help. By limiting intake of refined carbohydrates, excessive sugar, and foods high in saturated fat we can lower chronically elevated inflammatory markers that are responsible for chronic diseases such as arthritis. I hope these tips help you or someone you know improve quality of life. Ferrini AF, Ferrini RL. Health in the Later Years. 4th ed. New York, NY: McGraw-Hill; 2008. Hills, B. A., Ethell, M. T., and Hodgson, D. R. Release of Lubricating Synovial Surfactant By Intra-Articular Steroid. Br J of Rheum. 1998;37:649–652. Petrella RJ. Is exercise an effective treatment of osteoarthritis of the knee? West J Emerg Med.2001; 174(3): 191-196. Neustadt J. Western Diet and Inflammation. IMCJ. Vol. 10: 2 Apr/May 2011. Lopez-Garcia E, Schulze MB, Fung TT, et al. Major dietary patterns are related to plasma concentrations of markers of inflammation and endothelial dysfunction. Am JClin Nutr.2004;80(4):1029-1035. Rajaram, S, Connell, KM, and Sabate´ J. Effect of almond-enriched high-monounsaturated fat diet on selected markers of inflammation: a randomised, controlled, crossover study. BR J of Nut. 2010: 103, 907–912. This entry was posted in Chronic Disease, Fitness Training, Nutrition, Sports Medicine and tagged arthritis, fibromyalgia, gout, hands, hip, inflammation, joint pain, Knee, osteoarthritis, rheumatoid on August 24, 2012 by Joshua Stone. Is Your Diet Making You Sick? Inflammation is the body’s biological response to repair tissue and initiate healing after injurious stimuli has damaged tissue. When an irritant begins to damage tissue, a chemical response ensues. This response causes significant signs: Pain, Heat, Redness, Swelling and loss of function. Inflammation is how we survive and heal. Without this natural response, disease would take over our body. Inflammation is necessary; however, it can also be a serious problem, especially when the condition becomes chronic. The inflammatory response is the same regardless of the location or the stimulus that caused injury. After trauma occurs hemodynamic changes occur along with the production of exudate or edema. In acute inflammation, the tissue initiates a repair and remodeling event to return tissue to a normal state. If the inflammation fails to resolve, or inflammatory mediators remained elevated, the tissue will begin a cyclical process of a continued inflammatory response; this is when chronic inflammation occurs. Chronic inflammation is a common factor that may contribute to development of chronic diseases (1). Many diseases are now classified as inflammatory diseases, such as, vasculitis, atherosclerosis, diabetes, and arthritis. Elevated C-reactive protein (CPR) in the blood is a sign of inflammation. Individuals with chronically elevated CRP are three times more likely to have a heart attack than those who have low –levels. Now, studies are finding a correlation between chronic inflammation, chronic disease and poor diet. Researchers have found the diet has an influence on inflammation. Specifically, excessive consumption of refined carbohydrates, low dietary fiber intake, and a high omega-6 to omega-3 ratios are strongly associated with the production of proinflammatory molecules (2). Additionally, antioxidant’s decrease inflammation, and the low intake of antioxidants contributes to a proinflammatory state exacerbates disease (2). One large study compared a Western diet and a paleo-like diet. The western diet contained more red meat, refined carbohydrates and saturated fat. The Western diet group had greater levels of inflammatory markers, including CRP and E-selectin (3). Those following the paleo-like diet had a significant decrease of inflammatory markers (3). In addition, the Mediterranean diet, which is comprised of whole grains and omega-3 fatty acids was found to reduce inflammatory markers compared to baseline levels and eliminate metabolic syndrome after two years of following a Mediterranean diet and exercise (4). Cytokines, which are another key for chronic inflammation, are released by adipocytes. Thus general fat loss can reduce the expression of cytokines. Clinical studies in adults with high cholesterol have shown that nuts lower LDL-cholesterol while improving the overall blood lipid profile (5). Frequent nut and seed consumption is associated with lower levels of inflammatory markers such as C-reactive protein (CRP), IL-6 and fibrinogen, even after adjusting for confounding factors(6). Consuming a high-almond diet (68 g/d per 8386 kJ) for four weeks significantly decreased serum E-selectin compared with the control diet in healthy men and women (6). Chronic inflammation is linked to chronic diseases such as coronary heart disease, diabetes, atherosclerosis, and arthritis. The rise of these diseases over the past few decades may be linked to the Western diet of saturated fats, low antioxidants, and refined carbohydrates. A diet rich in omega-3 fatty acids such as fish and nuts as well as whole grains and high fiber have been shown to reduce chronic inflammation markers in the blood. Diet plays a much larger role than previously thought in the prevention of chronic disease. Are you ready to change your diet? Stehouwer CDA, Gall M-A. Twisk JWR, Knudsen E. Emeis JJ. Parving H-H. Increased urinary albumin excretion, endothelial dysfunction and chronic low-grade inflammation in type 2 diabetes: progressive, interrelated, and independently associated with risk of death. Diabetes. 2002;51(4): 1157-1165. Lopez-Garcia E, Schulze MB, Fung TT, et al. Major dietary patterns are related to plasma concentrations of markers of inflammation and endothelial dysfunction. Am JClin Nutr. 2004;80(4):1029-1035. Neustadt J. The food pyramid and disease prevention. Integr Med. 2005;4(6):14-19. Mukuddem-Petersen J, Oosthuizen W & Jerling J. A systematic review of the effects of nuts on blood lipid profiles in humans. J Nutr. 135: 2005. 2082–2089. 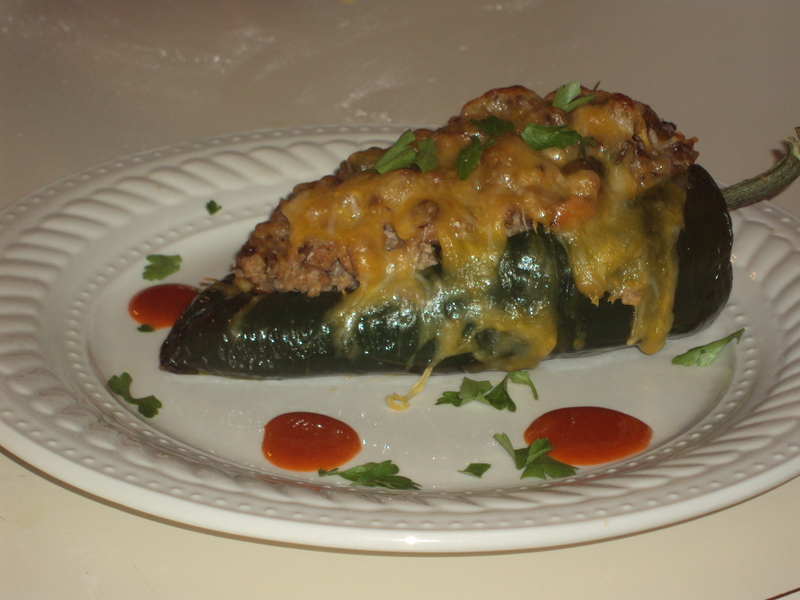 This entry was posted in Chronic Disease, Nutrition and tagged arthritis, cardiovascualr disease, Chronic disease, chronic inflammation, diet, gluten, heart disease, paleo, paleolithic on July 1, 2012 by Joshua Stone.